The first part of Thunderstruck slots was released in 2006 and back then, it was a simple 9 line video slot machine. Nonetheless it was a huge success and became to be one of the most popular games MicroGaming have ever made. Quite logically they didn't stop on that success and developed a second edition of this game, which is an amazing 5 reel, 243 line game offering so much more than the initial, first part did. There's a wild symbol that will substitute and double any wins, randomly appearing wildstorm that will turn reels into wild ones and extraordinary free spins feature, four of them to be more exact. This is a perfect game for all those people that want to experience a whole lot of action and high quality playing experience. One thing that is often underrated in Thunderstruck 2 slot is the wildstorm feature. It's a randomly appearing one and can turn reels into wilds. Note that up to all 5 reels can be turned wild, which can and will lead to a massive payout of 2,4 million coins. That's also the maximum win of the game. Even though the amount of features could easily overwhelm even the most experienced punters, after a couple of spins you get used to all of them. Later on you can't imagine playing a game that does not offer them. MicroGaming always follows the best standards, when it comes to designing their games. This doesn't only relate to the graphics, sounds or payouts. We are referring to gameplay and ease of playing. The playing panel features only a couple of buttons, with one missing. You might be used to change the amount of lines played on, but this is a 243 ways to win game, thus you always have the chance to win in so many ways. Other than that, the buttons are quie common and include +/- for adjusting coin size used to wager, ''coins'' tab will help you to change the amount of coins wagered (up to 10 of these can be wagered). There's also a ''Bet Max'' button, which does not really lead to wagering the maximum amount in the game. However, it uses your selected coin denomination and wagers 10 coins in the following spin. If you aren't quite sure how various features or trigger as well as how do 243 ways to win work, hit the ''view pays''. An excessive description of all mentioned aspects is available across four screens. Slots aren't really a game where you can develop a sound strategy, but there are some pretty significant tips that you'll be able to use when playing Thunderstruck 2. The most important one is to play for as long as you can. Why? 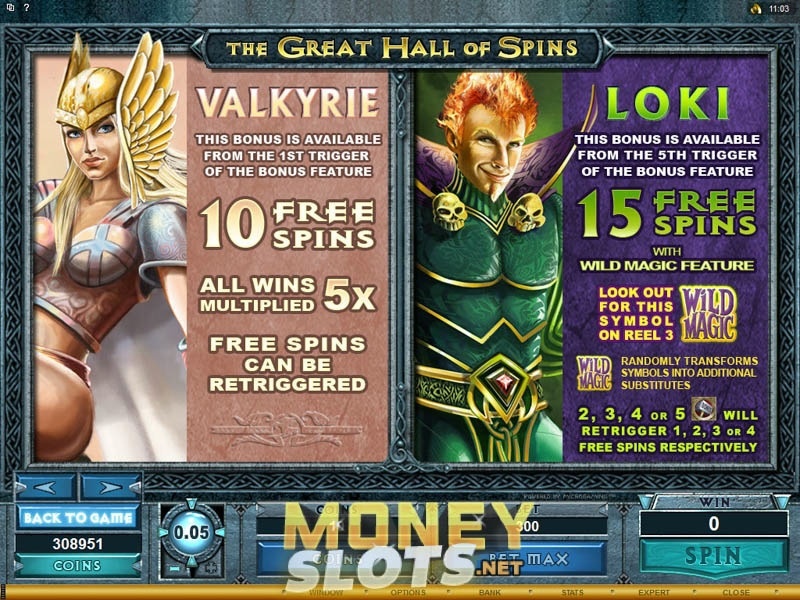 Because the ''great hall of spins'' is a progressive feature – the more times free spin rounds are triggered, the higher their value becomes. To make sure you'll play for long, use basic money management. Again, we can advise the 1% rule of never wagering more than a 1% of your balance per single spin.